Filebeat is an open source file harvester, mostly used to fetch logs files and feed them into logstash. Together with Logstash, Filebeat is a really powerful tool that allows you to parse and send your logs to PaaS logs in a elegant and non intrusive way (except installing filebeat of course). This guide will describe how to ask OVH to host your own dedicated Logstash on the Logs Data Platform and how to setup Filebeat on your system to forward your logs to it. It will also present you with some configuration setup you can use on Logstash to further structure your logs. Activated your Logs Data Platform account. To create at least one Stream and get its token. 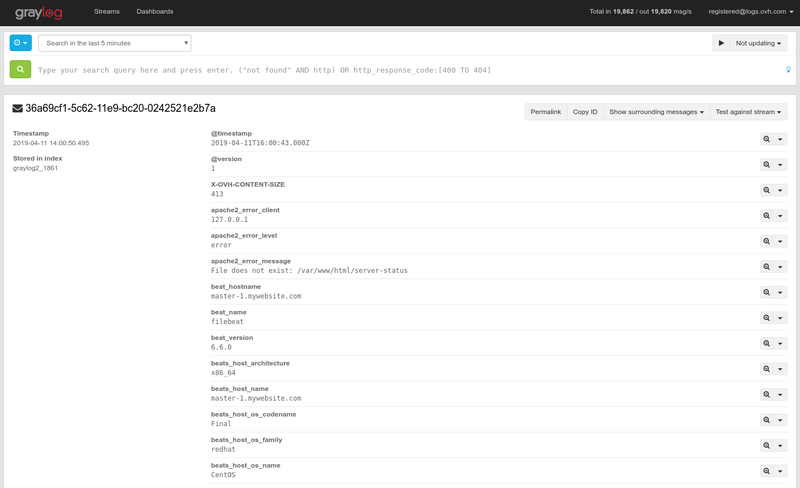 Attach your Graylog stream to logstash by using the list. Please refer to this guide first if you need to create a new one. Enter 5044 as exposed port. If you change it, you will have to also change it in the input section of your Logstash configuration. Click on Next to add it. On Configuration panel, select Filebeat from our configuration wizard. It will fill the input, filter and grok sections with common Filebeat usage. Once configured and tested, you can launch your Logstash by clicking on Start button. At the end the procedure, a hostname will appear in green, meaning your input has started. You will need this hostname for your Filebeat configuration. You can decide to setup Filebeat from a package or to compile it from source (you will need the latest go compiler to compile it) or just download the binary to start immediately. For this part, head to Filebeat download website to download the best version for your distribution. On Linux, try the Linux 64 bit if you don't know which one to choose. The following configuration files have been tested on the latest version of Filebeat available at the time of writing (6.7.1). The Debian installation package will install the config file in the following directory: /etc/filebeat/filebeat.yml. In the following example we will enable Apache and Syslog support, but you can easily prospect https://www.elastic.co/guide/en/beats/filebeat/6.7/filebeat-modules.html. Filebeat expect a configuration file named filebeat.yml . For the configuration to work, the important part is to replace *hosts: ["<your_cluster>-XXXXXXXXXXXXXXXXXXX.<your_cluster>.logs.ovh.com:5044"] with the hostname given by Logs Data Platform. You should also put the SSL Certificate authority of the dedicated input into a file, (ex: /etc/ssl/certs/ldp.pem). The input SSL CA certificate is available in the Home page of the LDP manager. # Boolean flag to enable or disable the output module. # Set gzip compression level. # Enable SSL support. SSL is automatically enabled if any SSL setting is set. # Optional SSL configuration options. SSL is off by default. Fill the value of /etc/ssl/certs/ldp.pem with the "Data-gathering tools" certificate you will find in the Home page of your service. # Filebeat will choose the paths depending on your OS. Ensure both file path exists on your system. Note the type value (apache or syslog or apache-error) that indicates the source file of the log message. You can easily display only your apache access logs for example by typing in the search bar fileset_module:apache2. Filebeat is a really useful tool to send the content of your current log files to Logs Data Platform. Combined with the filter in Logstash, it offers a clean and easy way to send your logs without changing the configuration of your software. There is a lot you can do with Logstash and Filebeat. Don't hesitate to check the links below to master these tools. Create an account: Try it free!